Let’s face it: A lot of people just come for the party. And a football party includes certain beloved standbys-from zesty chicken wings and pizza to spicy chili and saucy meatballs. Beer is a classic match, but game-day party fare serves up a wide range of flavors that can match just as well with wine as they do with the usual beer selection. 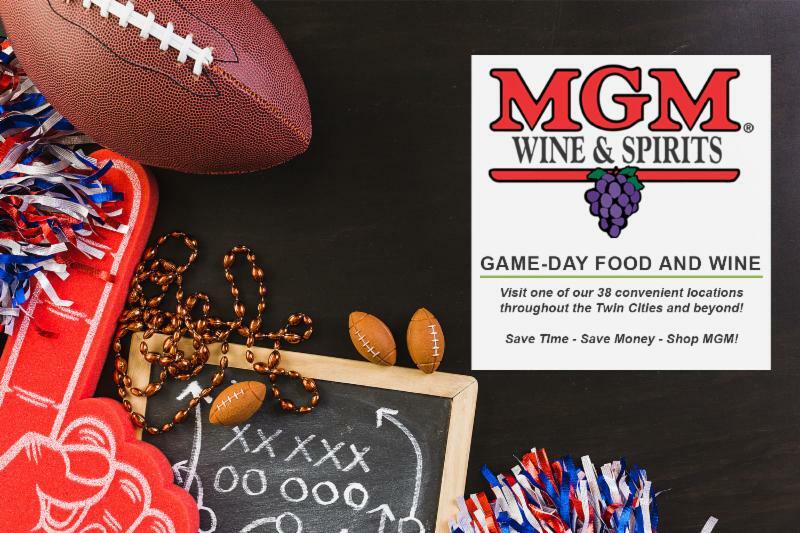 Here we help you tackle pairing wine with football party favorites-and those who are actually watching the game just may forget whether or not their team is ahead as they get lost in the winning food and wine highlights. Buffalo: Sparkling wine can temper the spice and heat-try ice-cold Prosecco. Barbecue Sauce: Chardonnay or Riesling for white wine fans; Syrah or Zinfandel for fans of red. 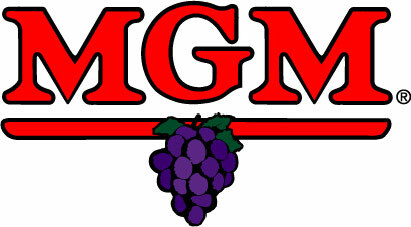 Lighter-bodied, fruity California Zinfandel, Côtes du Rhône, or Syrah-based red wine. Pair with chilled Torrontés from Argentina or cold Spanish Cava, especially if guacamole is on the table. Sparkling wine often goes well with eggs-try Cava or Prosecco. Sauvignon Blanc could also make a good match. All-American hamburgers go well with all-American wines such as Zinfandel. If it’s topped with cheese and bacon, consider Spanish Rioja. Tomato sauce calls for an acidic red such as Italian Chianti or other Sangiovese-based wine. With a sweeter sauce, Pinot Noir can pair well. Pepperoni or Sausage: Go with an Italian Barbera or a classic like Chianti. Veggie with peppers and onions: Try a Cabernet Franc-based red wine, or Sauvignon Blanc for a white selection. Supreme: When you have everything but the kitchen sink on your pizza, con- sider Italian Prosecco, especially a rosé Prosecco. Try a slightly chilled Beaujolais or an off-dry Riesling. Chilled rosé is an incredibly flexible style that can make peace with virtually any meat, cheese or condiment on a sub. Sauvignon Blanc-the herbs in the dip will cancel out the herbal notes in the wine, playing up its fruitiness. Merlot can balance the herbaceous veggies for those who prefer red. And if the table includes a selection of these dishes, guests will certainly want to sample a variety of tasty tidbits. So what wines can play nice with a plateful of these foods better than others? Chilled Prosecco or rosé are both very versatile. According to Domino’s Pizza, the pizza purveyor sells nearly 350 percent more of its pies on Super Bowl Sunday than a typical Sunday. These meatballs are a crowd-pleaser no matter what type of event you’re hosting and are equally delicious served for dinner with some crusty French bread and veggies. Preheat oven to 400°F. Spray a large casserole dish with nonstick cooking spray and set aside. Combine the ground beef, 1 minced shallot, salt, pepper, milk and breadcrumbs together in a large bowl. Mix well until completely combined. 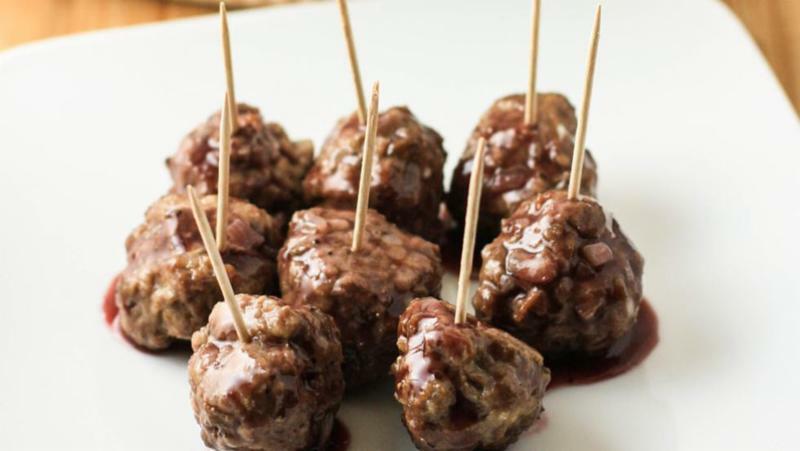 Form small meatballs out of the beef mixture and place in the casserole dish. Bake for 20 minutes or until meatballs are browned and cooked through. While the meatballs are cooking, make the sauce. Combine the wine, water, cornstarch and the ½ minced shallot in a large pan over medium high heat. Bring to a simmer and continue simmering for about 10 to 15 minutes. Add the grape jelly and Worcestershire sauce to the wine mixture. Stir well. Finally, add the butter to the sauce and stir to combine and melt. Continue simmering the sauce for about 6 to 8 minutes, or until sauce thickens greatly. Recipe and image courtesy of Barefoot Wine.